The Custom Craftworks Athena Massage Table is one of the best selling portable massage tables and a top choice for therapists. For more than two decades, most therapists are choosing Custom Craftworks Athena Massage Table over others. It’s fully customizable and thoughtful design optimizes practitioner comfort and self-care. At the end of the day, it helps keep you feel fresher while still giving clients the intended massage. This Athena table features premium materials and an unmatched craftsmanship. It can withstand rigorous test up to 650 lbs. of pressure. This Made in USA table contains environment-friendly components plus several unique attributes. Read on to learn more about Custom Craftworks Athena Massage Table. The Custom Craftworks Athena Massage Table is one of the best selling portable massage tables and a top choice for therapists. This premium table offers client comfort plus its design promotes good body mechanics and prevents injury. It contains the finest materials with superior craftsmanship including North American hard rock maple, American poplar, and birch and aircraft-quality cables. This massage table can accommodate up to 650 lbs. of working weight. It contains Shiatsu release cables, aircraft quality and vinyl coated for added protection. This makes folding and opening the table a cinch. It has a full-width extended hinge across the table for better strength and stability. The seven-ply reiki end panels offset legs and wires so the user can comfortably perform seated work at either end of the table. The dual end accessory ports on both sides of the table offer extra convenience when positioning the clients and allow versatility in a variety of settings. The dual knob construction creates extra stability. The table frame is made of high-quality birch hardwood for rock solid, professional strength. It comprises 3″ thick Multi-Layer Earth-Cell Foam padding, covered by supple, skin friendly polyurethane, making it durable and easy to clean. It’s American poplar legs are lightweight yet strong, resilient and resistant to warping. The North American maple side rails provide extra support and longevity. It uses CFC-free foam and water-based, non-toxic lacquers, making it an even environmentally friendly table. It is available in several beautiful and unique color options which can complement your décor. Dual knob construction ensures extra stability. Shiatsu release cables are aircraft quality and vinyl coated for added protection. The full-width piano hinge makes opening and closing the table very easily. The Seven-ply reiki end panels balancing legs allows comfortable work seated at either end of the table. The polyurethane upholstery is soft, durable and environment-friendly. The Birch, poplar, and maple maximize the table’s strength. Made in the USA with CFC-free foam and water-based, non-toxic lacquers. Made in Eugene, Oregon, with parts sourced globally. Its standard Massage Upholstery is available in 10 on-trend color options that are durable and easily cleaned. This customizable design can feature Prenatal Upgrade, breast-scapula recesses, rounded corners, side arm holes for use with extensions and crescent face hole w/ pillow and plug. It is ideal for practitioners, Therapists, spas, salons, resorts and more. The Face rest and carry case sold separately. It comes with limited lifetime warranty, ten-year guarantee against defects of legs and frame and two-year guarantee against defects of upholstery. The Custom Craftworks Athena is one of the preferred massage tables amongst users, therapists, spa, and salons. People really love its color options feature plus its sturdiness. It is eco-friendly yet durable. Jeanette bought a burgundy color massage table which she says is one of the best investments ever. This portable table is very sturdy and is easy to set up. The package deal was amazing on Amazon. Candie.corniuk bought this great product after a lot of comparisons. This table is one of the highest quality and very sturdy portable tables which she really loves. 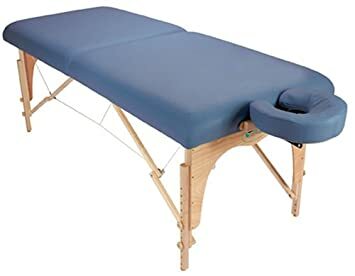 If you are looking for sturdy, durable, resistant and eco-friendly made in the USA massage table at affordable prices then Custom Craftworks Athena should be your first choice.